Porter tried the goggles look with my old (way too new) squash goggles and, given her great new bob, it wasn't half bad. If Al Gore is right, we'll all need these in a few years anyway, so you might as well stock up. This pair is up for auction on ebay. The eye cups appear to be tortoise shell bakelite with the frames, metal. 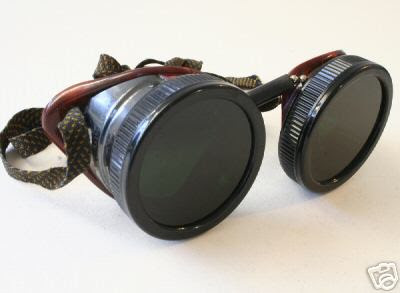 They come with two sets of lenses -- green for welding (and the end of the earth), clear for motorcycle rides or transatlantic flights in an open top plane. The auction lasts until tomorrow night. The current high bid is $35.00. Good luck and happy bidding!